Today I’m guest posting my recipe at Chef and Steward. Chef Lij and Kari are a husband and wife team behind their blog. Chef Lij is a sous chef at a fine-dining restaurant in a Five-Star hotel while Kari is a writer and photographer for the blog. Aren’t they the best food blogger team? They are expats currently living in Dubai, but originally from Jamaica. I hope you have some time to visit their site to see their co-effort creations on their blog. All the food looks outstanding and food photography is simply beautiful. 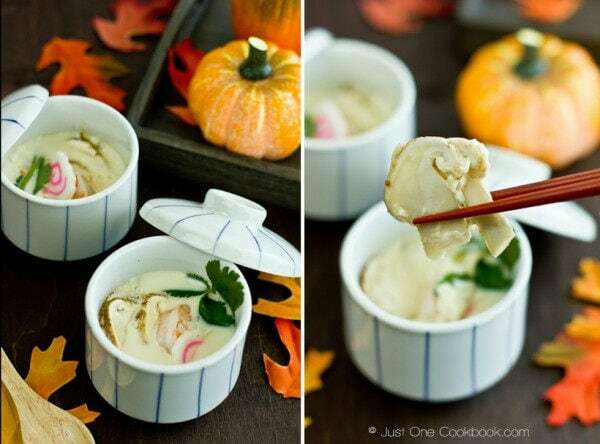 Kari asked me to make traditional autumn food so I prepared Matsutake Chawanmushi for them. Please click HERE to read my post. Chawanmushi is a savory egg custard which is often served as an appetizer. The egg mixture is flavored with dashi stock, soy sauce, and mirin, and it is steamed in a cup. There are many variations of Chawanmushi and restaurants in Japan usually include seasonal ingredients. Today I used one of the most popular ingredients in fall – Matsutake mushroom. As I mentioned in my Matsutake Gohan post, Matsutake mushroom (pine mushroom) is prized by the Japanese for its distinct aromatic odor and flavor. Its place in the Japanese cuisine is very similar to black and white truffle for the French. In Japan, top quality domestic Matsutake mushroom could sell for as much as $1000 per pound. Supermarkets sell import Matsutake mushrooms for less expensive price, but people still try to buy domestic as long as price is not too expensive. Luckily, even though we live in the US, we are able to get fresh Matsutake mushroom at nearby Japanese supermarket (grown in the US) for about $40 per pound. 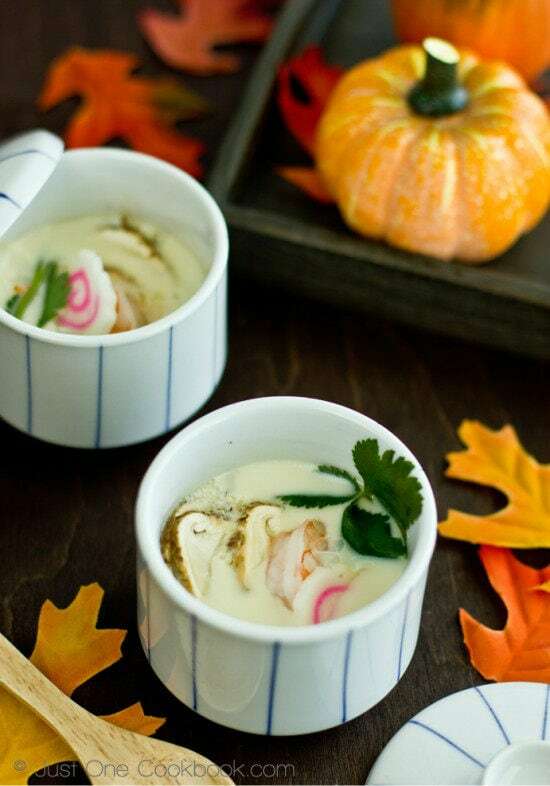 Matsutake mushroom is typically enjoyed in a soup or rice dish, but Chawanmushi is another fantastic way to enjoy this special flavor with its unique essence and taste. Chawanmushi is a savory egg custard which is often served as an appetizer. 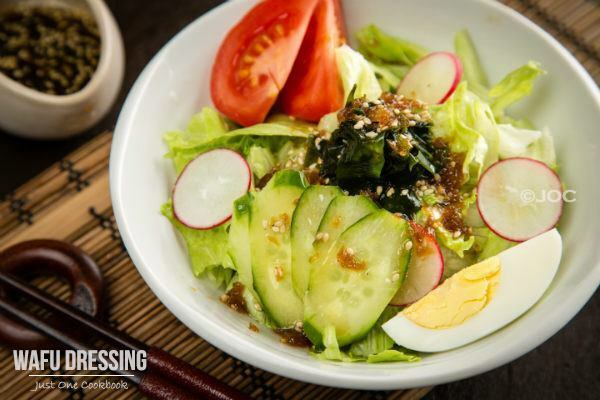 The egg mixture is flavored with dashi stock, soy sauce, and mirin, and it is steamed in a cup. Marinate the shrimp in sake for 15 minutes. 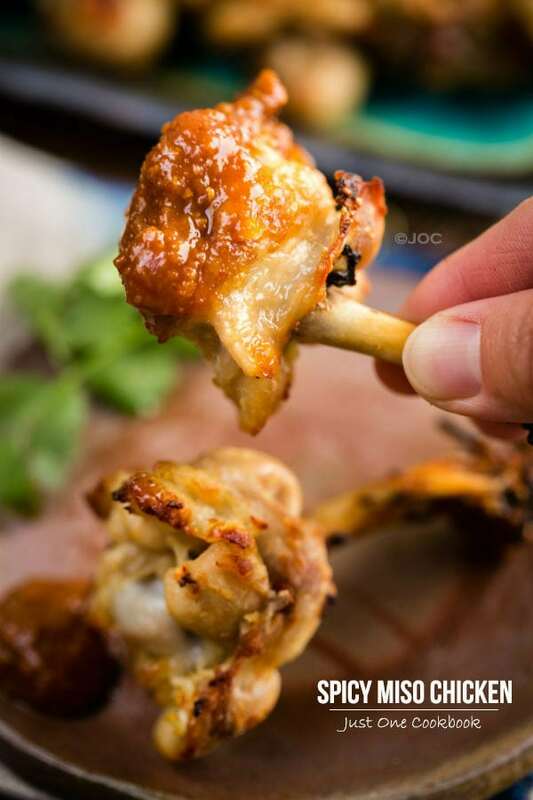 If you use chicken, cut into small pieces and marinate them in sake. Clean the matsutake mushroom with damp towel or paper towel. Do not wash the mushroom. Cut into thin slices. Whisk the egg in a medium bowl, but do not create air pockets. Add the seasonings and dashi. Then strain the mixture through a sieve into another bowl. In a large pot, bring water to boil. The amount of water should cover ½ of chawanmushi cup. When boiling, reduce the heat to the lowest heat. Divide all the ingredients into 2 cups. I started with one shrimp, ginkgo nuts, and matsutake mushroom. Then put naruto, the other shrimp, and mitsuba on top (the colorful ingredients should be near the top of cup). Lastly, tie mitsuba’s stem into a knot and put it on top. Gently pour the egg mixture into the cups without creating bubbles. Instead of covering the ingredients completely with the egg mixture, leave some ingredients exposed so it will be visually pleasing when cooked. Put the lid on (or cover tightly with aluminum foil if you don’t have chawanmushi cup). 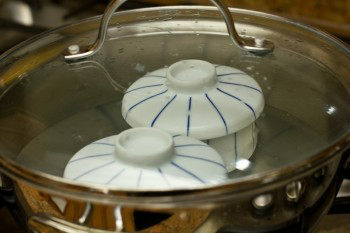 Gently place the chawanmushi cups inside the hot water (it should NOT be “boiling”) and cover the pot with the lid. Cook for 25-30 minutes on the lowest heat. If you are not adding shrimp and/or chicken, the cooking time should only be 15-20 minutes. Insert a skewer in the center of the cup to check if the egg is done. Serve warm. Soy Sauce: Use Usukuchi Soy Sauce (light color soy sauce) so the egg mixture will not become too dark. Oh Nami, chawanmushi is my favorite Japanese dish!!! I can’t get enough of it. They don’t really sell it in America’s Japanese restaurants for some reason. I want to make it, yet I don’t want to have to buy a chawanmushi cup because I know I’ll only use it once and then get lazy. Hee hee. What pretty pretty pictures! Beautifully presented ! Hope I get to try some matsutake soon…I’ll look out for them next time I go shopping, if I can find some. Fern (and other readers), I don’t know why some of email addresses that I’ve received before go into Spam…I found yours in Spam. I’m not sure why this one didn’t go into Spam… sorry about that. I always check Spam folder, so if your comment disappeared, it’s usually in the folder until I approve it. Thanks for the comment! I love their blog, that is a great place to guest post! Now I’m off to check out your post on their blog as well! What an intriguing dish! It looks absolutely scrummy. ah chawanmushi is one of those dishes on my “to try to make” list. this looks perfect for autumn! Nami, what an incredible recipe to come back to on your blog after being away for a week while I have been busy with my family tree. As always everything is so beautifully presented and photographed too! I love coming to your blog. There’s always something new to learn, like a new specie if mushrooms I’ve never heard before of. Thanks for sharing your knowledge and delicious recipes, your photos always make me hungry! A lovely matsutake recipe once more!!! I will soon be dreaming about matsutake at night! Your chawan mushi looks at least as lovely as the previous one (after your previous chawan mushi I went to buy genuine Japanese bowls with covers and stopped using the ones without covers, which always created a dry layer on top). I didn’t know chawan mushi could be cooked on the stove (my previous recipe advised the oven hot-bath cooking, which is a bit tricky). Thank you for sharing one more inspiring recipe! Wow Nami this is gorgeous, buzz, buzz, buzz, buzz, buzz, buzz, buzz, buzz, buzz! I would love to spend a day in the kitchen with you and learn how to make this. 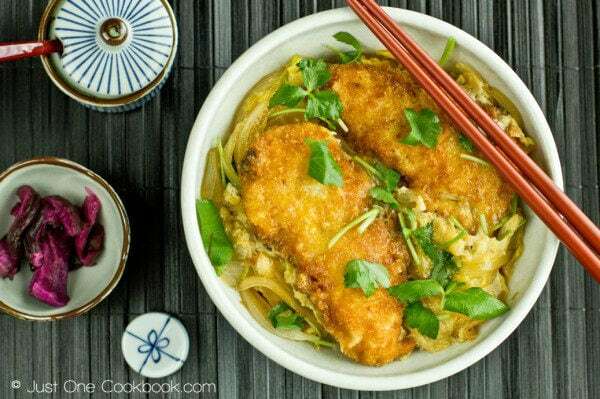 I love this recipe Nami! You done it again, very unique and authentic dish, packed with flavor from mushroom. Amazing photos, got to compliment you on that too! Thanks for introducing me to a new blog, Nami. This sounds so savory and your photos are beautiful, as always! Very beautifully presented Nami..love the way you style food..colorful & appetizing. I love this recipe ..healthy & easy..yet again! Thanks for introducing me to a new blog..headed now..
what a great and simple recipe! This is a method of cooking eggs that has been on my list of things to try for a while. And I can see them being great with the hearty tones of the mushrooms and the sea notes from the dashi and the shrimp! I have never tried chawanmushi before but the way you present the dish makes me want to try it very soon:). I so enjoy coming to your blog to see your recipes and photos. Thanks for sharing! Looks delicious and oh so comforting!! Also, I LOVE those cups!! They are so pretty. Nami another fabulous recipe. I love the composition of your pictures too. These looks so comforting and so easy to prepare. Nami, I want to try all your recipes haha. You think other mushrooms works too? I haven’t found any Japanese grocery around yet… maybe ill google it after i step out of your blog haha. Yes, Eringi (King oyster mushrooms), Shiitake mushrooms, shimeji mushrooms (all Japanese mushrooms) for example gives great flavors! awww more foreign mushroom.. love the cute ramakins!! Mushrooms lend such amazing flavor to any dish. Love subbing them in recipes when I don’t want to use meat. I love any and all mushrooms. I’d really love to try this! Hope you’ve a wonderful weekend! Matsutake what? I never had this kind of mushrooms…and would love to try them out…beautiful in this chawanmushi, so silky. What a great guest post…this looks fabulous, Nami! Love all of the colors. My roommate would be a very happy camper if I made this for her. Yes, Eringi (King oyster mushrooms), Shiitake mushrooms, shimeji mushrooms (all Japanese mushrooms) are great alternatives! Oh yummmy! Egg custard and mushrooms – perfection! Love the styling of your photos too. Gorgeous! I had a friend in college who used to make this for us!! Oh, how your picture brings back our those wonderful meals she and I shared together:) Thanks for sharing! This is a few of my favorite Japanese dishes. You did a beautiful guest post my dear. Lovely photos, fabulous composition. Nami your presentation is always breathtaking and descriptions so visual. I love reading your blog and look forward to trying each and every one of your recipes. I’ve only seen fresh matsutake mushroom for sale a few times here in NY. I’ll definitely try this recipe next time when I see the mushroom. Thanks for sharing! Stunning as always, Nami! You are absolutely amazing! This is beautiful! Like a work of art! Every of your food posted here all look so delicious..A nice guest post. Matsutake… what a luxury! Yum! Hi Nami, The chawanmushi is looking so delightful and appetizing. A very well made post with beautiful pictures as always. Loved ur little pots, looking too cute. I’ve bookmarked this special recipe of urs and wud love to give it a shot asap. Have a wonderful week ahead. Thanks & Regards, Sonia !!! We are so honoured to to have you! I think you have just found some new lovers in the Middle East! It is a great recipe and we are agreed with everyone who posted. 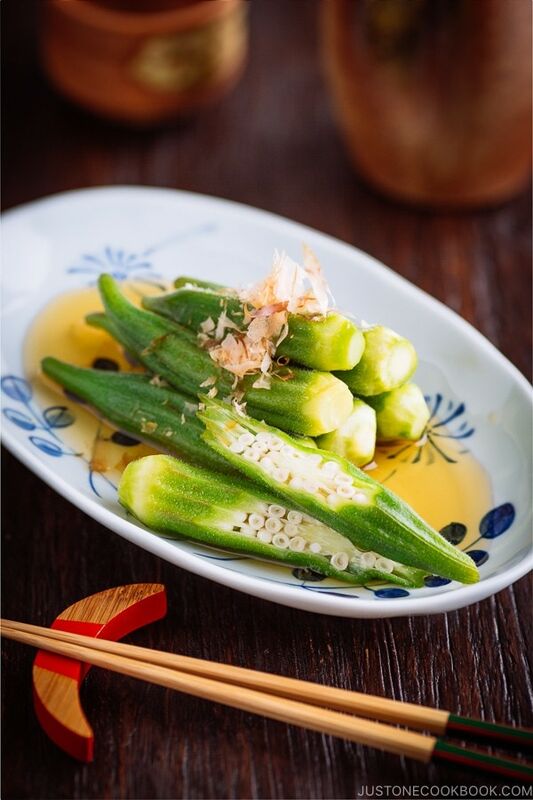 Fall is en vogue- Japanese style- so is the evidence according to Just One Cookbook! Kari and Chef Lij, thank you for inviting me to your blog! I’ve never heard of chawanmushi but it looks delicious. I like egg custards of all kinds and a savoury one with mushrooms has to be good. Elegant presentation! 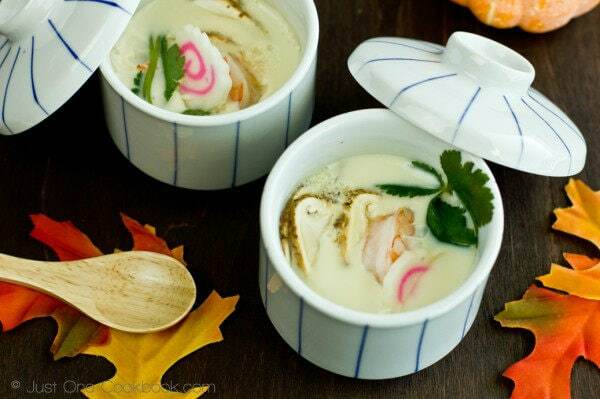 Love your presentation on this Chawanmushi dish. it makes me want to have a serving of this right down even at this hour (about supper time) 🙂 And once again thanks for sharing with us how to make this quick and delicious dish. Oh, Nami, you sure know how to make beautiful food! This custard looks fabulous…and I appreciate your hint about how to make it visually appealing…so true! I hope I get the chance to try these mushrooms some day…or even better, this delicious dish! I love Chawanmushi! What a great guest post. Heading over to check them out now! Very interesting recipe Nami. I am not sure I will like the mushroom in it but i am sure of the soup. Looks so pretty! 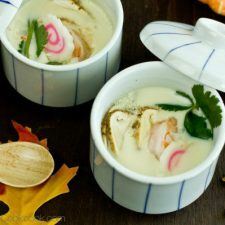 I like Chawanmushi and this looks great! The presentation is awesome, Nami. Doing a guest post for a sous chef must be such an honour! Beautiful pictures as always! I love your descriptions and the background information. I always feel like I learn so much! 🙂 Hope you’re having a great week! As always so delicate and full of flavors…. P.S Nami this my 3rd comment I hope this won’t vanish…. Wow your everywhere now, guest posting in good blog sites, it would be a real pleasure to guest post in a chef’s blog site. How exciting. Anyways that dish is so Japanese, great presentation with simple yet lovely flavours. 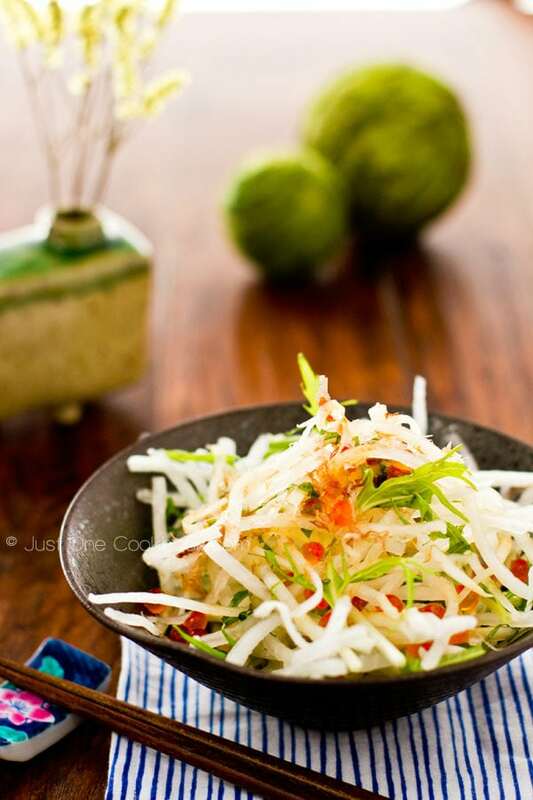 Your artistry in the kitchen just turns this humble dish into a wonder. I love chawanmushi for its clean and subtle flavours and I always order it in a Japanese restaurant. Best of all is all the seafood such as prawns or scallop and mushrooms that I can find in there like a little treasure trove! This looks amazing Nami as always. I have missed some of your posts while I was away and am trying to catch up. Also still trying to find dashi packaged without MSG so that I can make miso soup. All the ones I have seen have the MSG. Have a great week. Hi Nami – this sounds so delightful. I’ve been cooking with matsutake too. Hoping to share on Sunday. Your custards look so pretty. Thank you for sharing this! I have a single matsutake mushroom and this would be the perfect way to enjoy it. Just prepared and devoured this delightful dish! Can’t wait to buy more matsutake mushrooms and make it again :). Thank you! Thank you so much for letting me know that you enjoyed this recipe!! Yay!!! I still see Matsutake in a Japanese supermarket I go to. Enjoy until it lasts! I love the Chef and Stewart blog!They really are such a great team! Im catching up on all my blogs today and whenever I am behind and start going through all your posts I missed they always get me so hungry and make my bookmark list super long! I have never had chawanmushi before but it looks so good and super pretty! I love your dishes! just want to say that I tried out this recipe, and the chicken & tofu burger steak 2 weeks ago (I posted it on my blog)! Thank you so much for the recipes, they’re terrific! 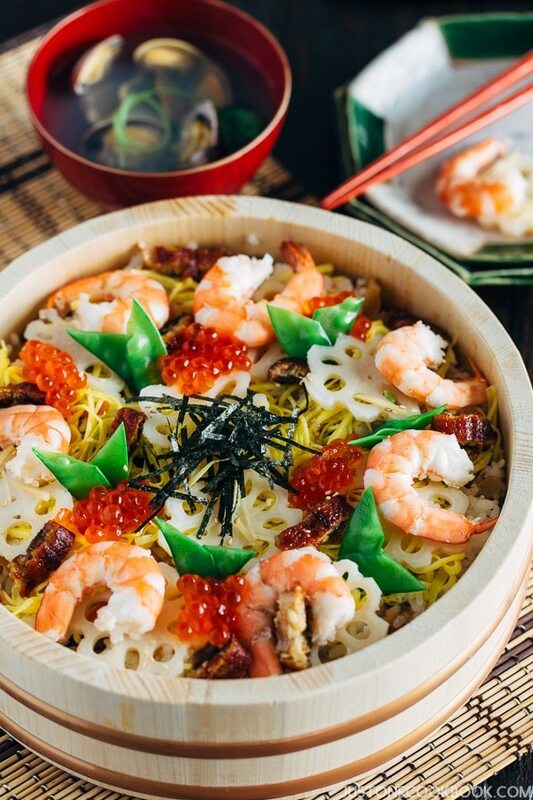 I love your site and am inspired to try more Japanese cooking! these chawanmushi are so adorable! i have never tried to make these at home tho! Hi Nami, our local Japanese market has matsutake this week and they are selling at $60/lb. I am going to make chawanmushi with them tonight and then matsutake gohan tomorrow. Wish me luck! Thank you so much for posting these wonderful recipes and pictures. I made your matsutake chawanmushi last night and it was the BEST recipe ever to showcase the wondrous matsutake mushroom. I used shrimp and small pieces of chicken thigh. Jus wondrous. Thank you! I had some beautiful chanterelle mushrooms and after sautéing them, I followed your recipe substituting them for the matsutake. Absolutely delicious! Thank you!